You will quickly note that if you delete a book from your library and then re-import your source HTML/CSS, you will need to enter all of the metadata and settings over again. This can grow very aggravating if you have to re-convert your book more than a few times. By the fifteenth attempt, you may find yourself staring at the metadata fields glassy-eyed and wondering just what you named that book again. 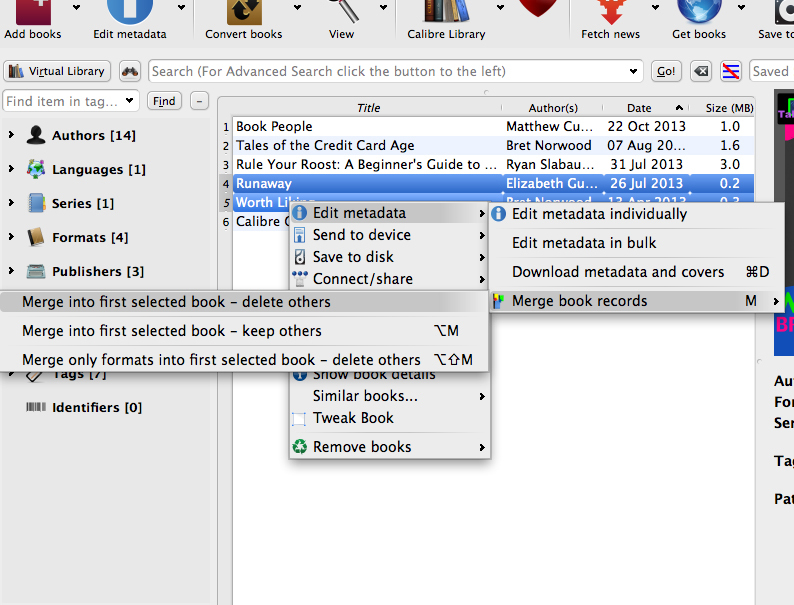 The “merge book records” function is your friend. With it, you shall preserve your brain from being whipped into repetitive-task-pudding. The only concern is that you must pay attention, or you risk accidentally deleting your book, which isn’t a big deal since you have the original HTML/CSS, but still you’d have to re-enter the metadata and settings again, which is exactly what we’re trying to avoid. Before you start, go ahead and right-click your entry in Calibre. Look for “Remove books” and “Remove books of a specific format.” Choose this and remove only the ZIP format. Then, drag your working HTML back into the Calibre library, creating a new entry. If you get a warning about already having a book with this name, just hit okay and ignore it. Now, the way it works is that you must select the book record you are merging into first. This is the old entry. Then you must control- or command-click the record you are merging. This is the new entry. Order is important. With both selected, you right-click on one of the highlighted titles and select the option shown in the screenshot above. This warning dialogue will come up. If the publishable title and the HTML filename are different, you can tell them apart and make sure in this warning message that the “first selected book” is the old entry, the one that still has your converted ebook(s) in it. To be clear: first selected book should not be the new, ZIP/HTML-only record. If, on the other hand, your title and filename are the same…well, you’ll just have to trust you clicked what you meant to click, cross your fingers, and hit OK.
Of course, if that trust is not there, you can use “Merge into first selected book – keep others,” but then you have the extra step of manually removing the unnecessary book record after you are certain that the keeper turned out okay. This accomplished, you can just select the title and convert again with ZIP as your input and EPUB or whatever you want as your output. Your previous conversions will be overwritten, but your metadata will be preserved. The only settings you might have to enter again are the format-specific ones, depending on what the last format you converted was. I have been searching for a way to update my listed books in Calibre for a while and now finally I have found this procedure. Have to say though that I am a little disappointed it is not slightly more intuitive. I think Calibre is an excellent resource generally and I have been very glad of it since I found it, but you would think that some of these steps would have been automated in a little ‘wizard’ or something similar. I would imagine that there are an awful lot of people using the program that have this exact problem, so perhaps making this task a bit simpler is on a to-do list somewhere waiting for coding resource. That said it is a free resource and there is only so much time available, so I am not going to complain too loudly. It is a minor annoyance and, as you have now shown, there is a way to do it. Plus like most things, once you have done it a few times I am sure it becomes second nature. 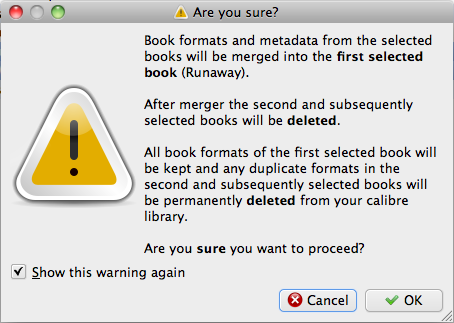 Yes, after I went through these steps a few times, I could re-import and merge a book at speed without thinking about it, but it isn’t the least bit intuitive. Still, it’s certainly saved me a lot of time and aggravation. Revising an ebook before I knew about this was a major pain. Thanks for your comment.